In Juniper Green Village Hall and garden. MaRoberts: fine cooking sauces from an original Tanzanian recipe, all hand-made in small batches for the best flavour. Molly’s Café: tasty breads and baking treats to enjoy, all made in Juniper Green’s own local bakery. Serving fresh hot soup on the day too! Sweet Desire: hand-made tasty range of confectionery for a sweet treat – cake pops, fudge, tablet, mallows and more to enjoy. 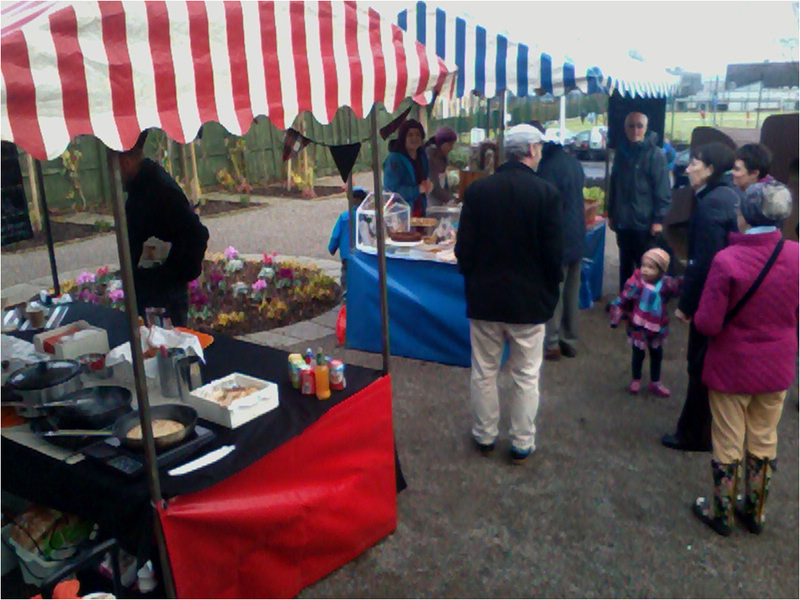 Scoff Street Foods, with a selection of tattie wraps including a great breakfast version! plus hot filled rolls and hot and cold drinks too. Last month 200 people arrived to enjoy local producers’ wares, including top quality fresh fruit and veg at ASDA beating prices, delicious street food, home made sweets, sauces and preserves, Scottish and Swiss baking and Fair Trade goods. We hope to able to bring back meat and fish stalls if we can maintain, or even improve on, this footfall. Please support your local market!